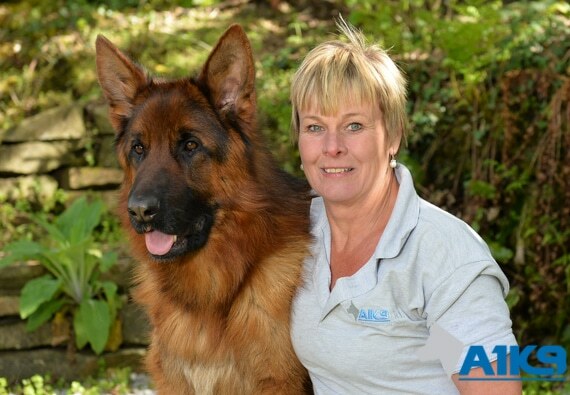 Sara originally came to A1K9 to socialise and train one of her own German Shepherds at our group dog obedience training classes and she enjoyed it so much, she volunteered to help Gaynor as an assistant. A dog owner for many years and having had many dogs of her own, it had always been her dream to earn a living working with dogs; so when a vacancy for a part time job at A1K9 became available she jumped at the chance. Joining our staff in 2013, Sara is a real team player and is always happy to muck in often helping out with grounds maintenance when we are pushed to get jobs done. She is becoming a very accomplished trainer and her committed and cheerful approach to her work is appreciated by the dogs that she trains, other staff members and our customers. During her free time, Sara spends lots of time gardening or getting out and about with her own 2 German Shepherds and her very old rescue Greyhound.